Face primers are a great way to smooth, prep and perfect the skin before applying foundation. If you have acne scars, fine lines or large pores, a makeup primer can spackle those spaces for an even coverage. However, some people can be allergic or sensitive to the main ingredient found in most makeup primers, silicone. Silicone is a chemically derived product that sits on top of the skin to protect and keep moisture in. Any product used with that “slippery/silky” feel to it, more than likely contains some kind of silicone. To identify silicone in a product, look for Dimethicone or Methicone in the ingredient list. The general rule of thumb is that anything ending in “cone” is likely to be silicone. Opinions however, are divided as to whether silicone is indeed good or bad for the skin. Unless you have a sensitivity to silicone and your skin reacts with break-outs or irritation, it seems quite harmless. Silicone is used in almost every product we use on the body from haircare to skincare. To immediately confirm sensitivity to silicone, notice if you breakout on your back from the hair conditioners used. Silicone is abundant in these products and can be the culprit for reoccurring back acne. Currently, I have two favorite face primers, one silicone-based, one silicone-free. The main activities I look for in a primer are: skincare properties (I do not believe in adding another step to my daily routine – unless it is good for the skin), ability to smooth the skin and longevity. Hourglass – Veil Mineral Primer SPF 15: This is a wonderful silicone-based primer. It applies effortlessly, smooths the skin, increases the longevity of my face makeup and gives the skin a subtly glow. It contains anti-aging benefits and restores moisture to dehydrated skin. I use this primer for “special occasions” – mostly when I am wearing a full face of makeup. I have found that mixing a small amount of this primer with your foundation produces a flawless, airbrushed-look. 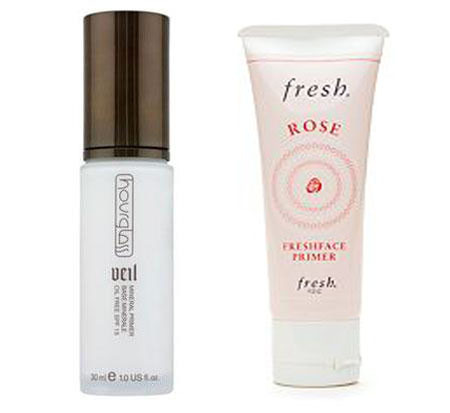 Fresh – Rose Freshface Primer: This is the first silicone-free primer I have tried and now can’t live without. I use this primer on a daily basis and sometimes as my primary moisturizer. Packed with rosewater and cucumber extracts, this lightweight lotion immedietly soothes redness and evens out my skintone. It contains vitamins and botanicals that are beneficial to the skin and smells like a bouquet of roses. I do notice a difference between the two products, in terms of skin smoothing. Silicone is currently the best ingredient for reducing the appearance of fine lines and pores. This is why the majority of makeup primers on the market contain them. However, there are many silicone-free products on the market and I assume many more will emerge in the future.